This one would be even more remarkable. Fifty-eight-year-old Bernhard Langer used all his wits and guile to shoot a 2-under 70 on another challenging day at Augusta National, giving himself a shot Sunday at becoming the oldest major champion in golf history. Leader Jordan Spieth - who was born almost four months after the second of Langer's Masters victories in 1993 - was still on the course when the German finished out his stunning round on a bit of a downer, making bogey at the 18th after an errant drive left him behind a giant magnolia tree. But Spieth finished with a double-bogey, putting Langer just two shots behind and playing in the next-to-last group Sunday with Japan's Hideki Matsuyama. "I would say I'm surprised, but doesn't he win almost every tournament on the Champions Tour?" Spieth said of Langer. Not quite, but he does have 25 victories since joining the 50-and-over tour in 2008. Now, going against a bunch of guys young enough to be his kids, Langer was positioned to beat the record for oldest major winner by a full decade. "I believe I can," he said. "If I play my best, I can shoot 4 or 5 under." Julius Boros was 48 when he captured the PGA Championship in 1968. Nicklaus remains the oldest Masters champ, taking his sixth title at 46. And it was Nicklaus who contended again one final time at Augusta in 1998, at roughly the same age as Langer, before settling for sixth. "I've been saying it's going to happen sooner or later," said Langer, mindful that two other players over 50 - Davis Love III and Larry Mize - also made the Masters cut. "Guys like Davis Love and Vijay Singh and Fred Couples are long enough to win the majors. I'm not quite at their distance, but I try to make up for it in other areas." Playing alongside the world's top-ranked player, less-than-half-his-age Jason Day, Langer showed that there are many ways to get around Augusta National. At the eighth hole, the 28-year-old Day drove it nearly 300 yards, and then left his approach about 40 yards from the flag. Langer's drive was some 50 yards behind the young Aussie's, which was pretty much par for the course all day, and he was still some 100 yards away after his second shot drifted off to the right. But Langer stuck his third shot to 4 feet and made the birdie putt. Day left his much-shorter approach shot 7 feet off the flag - and missed the putt. "Jason was outdriving me by many, many yards," Langer said. "That was a big difference to make up. But so far, so good." "When you consider some of the positions he is playing from compared to where I was, it was unbelievable," said Day, who shot 71 and was one stroke behind Langer's 1-under 215 total. "He plods along and knows his strengths and weaknesses. I had a lot of fun playing with him. I could tell how gritty he is and how much of a competitor he is." 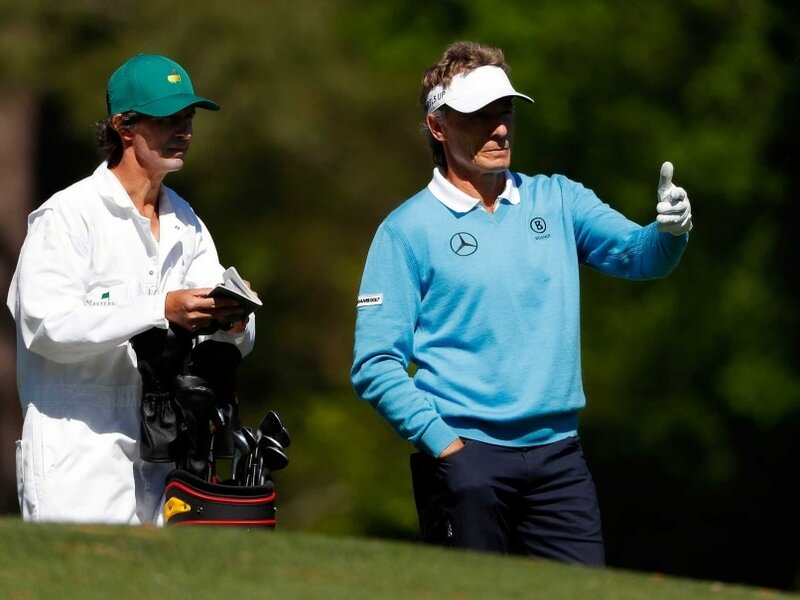 Langer, who will turn 59 in August, used a run of three straight birdies through the middle of the back side to charge up the Masters leaderboard, highlighted by a chip-in at the 14th after Day sank a long putt of his own. Tom Watson was 59 when he lost in a playoff at the 2009 British Open, but that was on the links of Turnberry - a manageable layout for a senior still on his game. But Augusta is a young man's course, which is why Watson played the Masters for the final time this year and Ian Woosnam, who is actually a few months younger than Langer, announced Friday he was done after shooting two rounds in the 80s. Langer is still trim with a full head of wavy air, albeit with a bit of gray around the edges. He doesn't concede anything to the younger players. "There are different ways to get around out there," he said. Langer leaves nothing to chance. As he stepped to the ninth hole, he kicked away a magnolia leaf, carefully paced off where he wanted to tee it up from, then brushed off a couple of more leaves. He is steady and persistent, a professor of the fairways, taking full advantage of the vast knowledge accumulated over 33 Masters appearances. He won the tournament in 1985, while playing the final day in the next-to-last group with the late Seve Ballesteros, and it was Langer who awarded Nicklaus the last of his six green jackets the following year. Langer won again at Augusta in '93 for his only other major. Now, he's got a shot at one for the ages. Bernhard Langer, who is 58,is two shots behind leader Jordan Spieth. Langer has won the Augusta Masters twice.